In India, the diamond has traditionally enjoyed great fame as a talisman, thanks to its exceptional hardness and other properties. It was a symbol of courage and virility, qualities that were considered exclusively male. It is said that when Alexander the Great reached the Valley of Diamonds he saw that the valley floor was studded with diamonds guarded by giant snakes with deadly gazes. But Alexander had a plan and cheated the snakes out of their diamonds. Romantics would have it that the love darts of the Roman god Cupid were made of diamond. Less romantic was Catherine de Medici’s habit of getting rid of her adversaries with poisonous ‘inheritance powder’ made from finely ground diamonds. Today, the diamond has grown to become the symbol that defines important emotional events such as an engagement, birth or anniversary, or to immortalize personal achievements. This entry was posted in Diamonds on 18th May 2016 by Karen White. After diamonds rubies is the hardest gemstone known to man. It is also resistant to acids and other harmful substances. This makes it an ideal stone to set in precious jewellery as it can handle the daily knocks. Rubies and sapphires are both composed of corundum, which is the crystalline form aluminium oxide. They differ only in small amounts of colour-producing minerals. Chromium gives rubies their characteristics red colour, with higher concentrations producing darker shades. Aluminium oxide not containing chromium are called sapphires; they come in many hues including blue, yellow, green, pink, purple and colourless. Natural rubies are found in a handful of sites around the world, most notably in Myanmar (formerly Burma), Thailand, Sri Lanka, Afghanistan, Tanganyika, and North Carolina. Beautifully coloured, transparent crystals are prized for jewellery use, while translucent or opaque stones are used for ornamental items such as clock bases. Natural rubies have been mined for 8,000 years or more. In many cultures, the gems have been prized not only for their beauty but also for supernatural powers; it was commonly believed that the ruby’s red colour came from fire trapped inside the stone. Ancient Hindus believed that rubies could make water boil, and early Greeks thought the crystals could melt wax. In other cultures (e.g., Burmese and Native American), the ruby was thought to protect a wearer because of its blood-like colour. Because it was so highly prized, the ruby was the first gemstone to be made artificially. Documented attempts to make rubies date to the experiments of Marc A. Gaudin, a French chemist who produced some synthetic rubies beginning in 1837. They were not of any value as gems, however, because they became opaque as they cooled. After 30 years of experimenting he gave up, admitting defeat in the published notes of his final ruby experiments. Around 1885, some rubies sold as gemstones were discovered to be man-made (their unusually low price prompted the buyer to have them carefully examined). The method by which these so-called Geneva rubies were made remained a mystery until about 1970, when an analysis of surviving samples showed that they were formed by melting powdered aluminium oxide and a smaller amount of chromium oxide in an array of torches, and letting the molten material solidify. Later, Auguste Verneuil, another of Frdmy’s students, developed a somewhat different process that eventually became successful. By 1891 he was producing rubies by flame fusion, although he did not publish a description of his technique until 1902. His assistant exhibited the synthetic rubies in 1900 at the Paris World’s Fair, where they were quite popular. His process took only two hours to grow crystals weighing 12-15 carats (2.5-3 g); the stones were roughly spherical, up to 0.25 in (6 mm) in diameter. By the time Verneuil died at the age of 57 in 1913, the process he had invented was being used to manufacture 10 million carats (2,000 kg, or 4,400 lb) of rubies annually. During World War II, it was impossible to get rubies from traditional sources in France and Switzerland. Because these stones were vitally important for use as bearings in military as well as civilian instruments, efforts were made to improve manufacturing techniques. One such improvement, developed by the Linde Division of Union Carbine Corporation, modified Verneuil’s flame fusion process to grow thin rods of ruby crystals up to 30 in (750 mm) long. Such rods can easily be sliced into disks to produce large quantities of bearings. A process developed by Bell Telephone Company in 1958 employed high temperatures and pressures to grow rubies on seeds that had been produced by flame fusion. Refinements of this technique became known as the hydrothermal method. Carroll Chatham, a San Francisco gem manufacturer who developed and used a hydrothermal process, also developed the first commercially successful application of the flux process of ruby manufacture. This technique, first used in 1959, essentially creates roiling magma in a furnace and grows very natural-looking gems in a period of nearly a year. Because of the industrial uses demand for very high-quality crystals of particular sizes and shapes, synthetic rubies are created in a laboratory. With the exception of minor amounts of impurities, synthetic gems have the same chemical, physical, and optical properties as their natural counterparts. 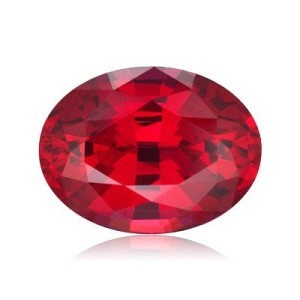 Although some are used as gemstones, about 75% of modern synthetic ruby production is used for industrial purposes. Only the highest quality synthetic rubies are used in jewellery as gemstones. How can you tell a synthetic ruby from a natural one? Many people are not aware that the majority of rubies on the market today are actually created in a lab, or have been enhanced in some way. How can we know the difference? Let’s find out. The main difference between natural rubies and synthetic rubies is where they have been sourced from. Natural rubies come from below the ground while synthetic rubies are made in a controlled laboratory to produce the highest quality rubies. In order to test whether a ruby has been lab-grown, a gemologist would need to analyse its structure and chemical composition. It can be difficult to tell the difference, as similarities between a natural and synthetic ruby may seem very much the same. Under a microscope, curved “growth lines”, along with microscopic gas bubbles, would be the main structural differences that a gemologist would look for. The main chemical difference that a gemologist would look out for, is traces of lead. If traces of lead were found in the stone, this would indicate that it is synthetic. However, even with these differences, stones created in the lab are being improved all the time. Lab testing is not as reliable as it used to be because the synthetic rubies are becoming increasingly identical to the natural stones, even under the microscope. The biggest difference between natural rubies and synthetic rubies is in the price. As natural rubies is dependent on finding a high quality gemstone ruby as this is rare the price is very high. However with modern technology we can now produce in a laboratory what mother nature previously could produce and we can control the impurities in the rubies, hence the lower price for them. This entry was posted in Gems on 17th May 2016 by Karen White.